Get heat resistant, triple-wall pipe online here at PlumbersStock.com. When it comes to installing anything HVAC-related, you want to make sure that you are using the correct venting, especially when it comes to stove pipe. Make sure triple-wall stove pipe is right for your project. The installation of a fireplace must be accompanied by some venting to carry the smoke and exhaust away from the structure in which it is being used. The HVAC industry offers a wide selection of wall pipe that allows you to choose the most efficient type of piping for your needs. Triple-wall pipe is likely your best and safest option. 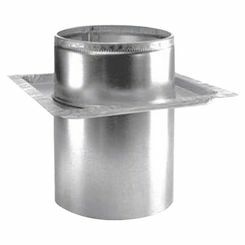 With a series of three different layers, triple-wall chimney pipe ensures gases are vented properly. How Does Triple-Wall Pipe Work? Venting a fireplace is a task that should be done correctly the first time. The first step to ensuring that the ventilation is done correctly is to select what type of wall piping you would like to use. There are three different options for wall pipe, single, double, and triple-wall pipe. Each type of pipe is designed to vent for a stove or fireplace, and each pipe has its pros and cons. Triple-wall stove pipe offers three different layers of piping within itself. When using this pipe, you are ensuring that the exhaust gases remain hot allowing them to vent out correctly. Not only does it allow your fireplace or wood stove to vent properly, but it protects against burning hazards. These three layers ensure that the gases are getting out of your home without any leaks as well as keeping the outside layer of the piping cool to the touch so you don’t have to worry about curious kids who may touch it and suffer unwanted consequences. 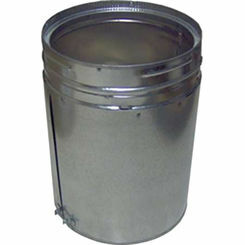 Like all venting pipe, triple-wall chimney pipe is available in different sizes as there are different venting needs. The sizes available are 6”, 8”, and 10”. Triple-wall pipe is also available in a variety of different lengths so you venting system can be designed to custom fit your needs. By making triple-wall piping available in a variety of sizes and lengths, you can conveniently maximize the efficiency and configuration of your installation. The installation of triple-wall stove pipe is a fairly easy process. Each piece of pipe is designed with one end that has a male connection and one end that has a female connection. The pipe is connected to each other with a simple twist and snap making the installation a breeze. 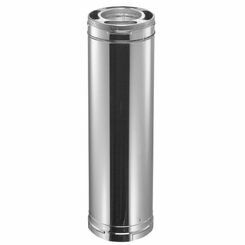 At PlumbersStock, we have triple-wall pipe available from trusted manufacturers like M&G DuraVent, which is an excellent choice when it comes to your venting needs. It is rated to withstand temperatures up to 2,100 degrees that provides you with the ultimate fire protection all the while carrying harmful gases away from your home.